Kings and Criminals is a work of thriller fiction written for young adults by author Mungo Magennis. The novel focuses on the visionary young Max, who sees the intense problems of the world he’s about to become an adult in, and wants to devote his future to fixing them. As such, Max begins a collection of other young people with the goal of training them for important positions that will bring about a future change of government, culture and ideology. But even as his grand plan is starting to develop, the world around Max changes again for the worse, and his group of future freedom fighters must decided whether the fight now is more important than the one yet to come. An epic and complex work of political ideology lies behind this interactive narrative of offbeat teens, and I’d certainly recommend Kings and Criminals for older teens and new adults reflecting on recent times. Max is a very forward thinking character, a young prodigy that readers may not relate to, but will certainly look up to as he fights for his noble cause. The characters who join him in his mission round out the crowd of diverse and interesting political opinions, engaging in a very hopeful future and a powerful revolt when things take a difficult turn in their present day. Mungo Magennis is an author with a similar vision to his main character, penning a compelling narrative and argument for the future of a broken world. A highly readable and important tale. Kings and Criminals by Mungo Magennis is an interesting young adult thriller, compelling and inspiring. A sixteen-year-old boy can’t stand the distress and the brokenness he witnesses around him, and hooked on the idea of bringing change to the world, he comes up with a bold idea, one that has a powerful grip on him. Create a secret group of dedicated young men with unique skills and prepare them for positions of influence in the country. This is a bold idea and it seems easy, but has the young man considered the challenges that await them and how ruthless society could be? Will they have what it takes to succeed, to stand for each other when needs be? The reader is immediately introduced to the setting and I loved the way it comes out in the opening part of the narrative: “The Scottish hills undulate behind the estate, gifting its visitors to views of rolling mist early in the morning and fabulous sunsets to the west as the evenings arrive.” Mungo Magennis describes beautiful settings, offers delightful views to readers, and explores cultural and political elements that make the setting one of the most important pieces in the story. The prose is beautiful, with turns of phrase that are unique to the author, perhaps reflecting the world of the characters. The dialogues are naturally woven into the narrative. This is one of the books that inspire young readers to go after bold and lofty ideas, a story that brilliantly showcases the themes of teamwork, loyalty, and sacrifice for the common good. It is as entertaining as it is inspiring. 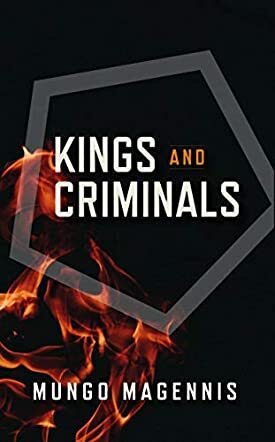 Kings and Criminals by Mungo Magennis is the story of a young man who wants to organize it so that a small group of his friends can be placed in a position of power. The story begins with a distraught father who has just placed his son into rehab for alcohol addiction. He is suffering from PTSD and the alcoholism is caused by this. The idea behind his decision is an interesting one, particularly in the current political landscape. Can a small group of like-minded individuals make a difference? Or are they doomed to become like the rest? It is not an easy journey, but one they all feel compelled to go on together. Mungo Magennis has created an interesting story with Kings and Criminals and I think it could do quite well on the market. Kings and Criminals had a good pace and the story kept moving forward. It covers a lot of different areas including current events, mental health issues and what it means to have real power. It's a little bit different to what is already out there and would certainly get readers thinking. I think the characters were well developed and the dialogue was believable. Writing about issues like addiction and PTSD can be difficult, but I think these are handled well and explained well to the audience. The characters were individual and easily distinguishable from each other. I would recommend it. I do also think that it could appeal to a broad range of readers from young adults to adults too.